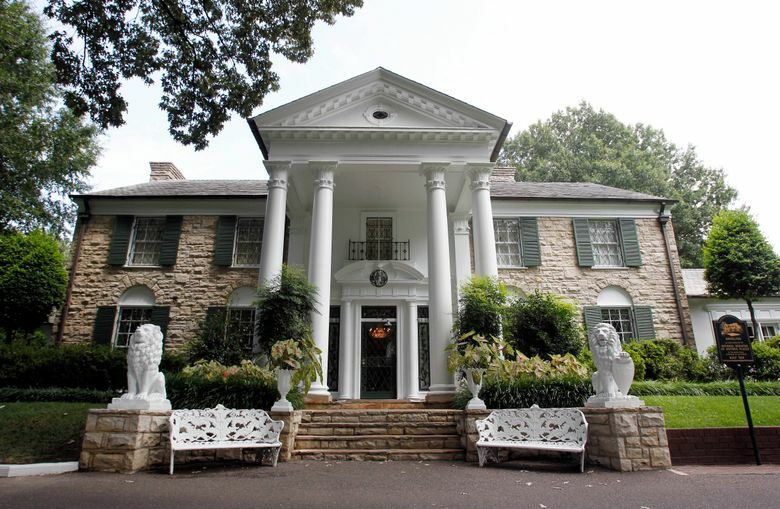 Some 170 authenticated artifacts will be up for auction at Graceland, Elvis Presley's longtime Memphis, Tenn., home. MEMPHIS, Tenn. (AP) — A diamond and gold pendant Elvis Presley gave Sammy Davis Jr. was among 160 authenticated artifacts sold Thursday evening during an auction at the King of Rock ‘n’ Roll’s longtime Memphis, Tennessee, home. The auction at Graceland was part of Elvis Week, the annual commemoration of his death. The pendant sold for $32,000. Other highlights included one of Presley’s personal handguns that sold for $96,000, and a racquetball shirt worn by Presley, which went for $32,500. Bids were accepted online for several weeks prior to the live auction, when all the bids were brought to the floor, said Laura Pickett. She’s managing director of Graceland Auctions, which handles auctions for Graceland. Pickett said all the artifacts are from third-party collectors; nothing is owned by Graceland itself. She didn’t elaborate but said the items may appear in a future auction. This was the third auction, with the past two held on Presley’s birthday and during last year’s Elvis Week. Presley died at age 42 on Aug. 16, 1977. Those items pulled included a “Starburst” jumpsuit Presley wore during concerts in Las Vegas in 1973, and a guitar signed by Presley, Johnny Cash, Carl Perkins and Jerry Lee Lewis. “It’s pretty common for every auction to have a few items pulled,” Pickett said. Presley gave the 14-karat yellow gold owl ring to a fan after a concert in Lake Tahoe in May 1973. Selling price: $32,500. Presley gave the gold pinky ring with 15 diamonds to a member of his inner circle who started working with Presley after he returned from his military service and continued working with him until the early ’70s. Selling price: $27,500. The 1962 dark, charcoal-colored suit was worn by Presley in the MGM movie “It Happened at the World’s Fair.” Selling price: $25,000. A shirt Presley pulled from his personal wardrobe and signed was to be used as the grand prize in a 1973 Boy Scout raffle. Selling price: $16,250. A collection of Presley’s first five singles. Selling price: $3,375. Presley’s U.S. Army-issue sewing kit, accompanied by a black-and-white photograph that appears to depict a dress-uniform-clad Presley sewing his daily Army fatigues. Selling price: $2,750.